Don’t breath to close to your screen right now, I think I have a fever. My eyes are pink and I feel so warm that my check are in blossom. Red roses and pink colours, my usual favorites, but not today. I’m at home reading this book (in Swedish), looking out on the melting snow and sun-colored trees outside my window. I feel sorry for my self, but I have my cat keeping me company (curled up in the window in front of me right now), and the little bunny in today’s post! 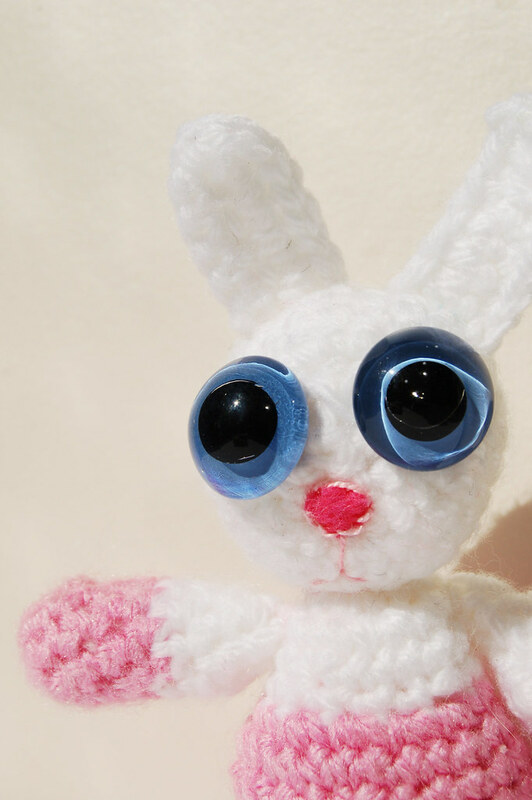 I don’t remember where I saw the little bunny or rabbit that inspired me to try to crochet one of my own, but Eye-Boo the Bunny is what came out when I tried. I held the biggest glass eyes to her head and P and me just started to laugh so much when we saw her with her enormous eyes. I wouldn’t have attached them if he hadn’t told me that I should, but I’m glad he encouraged me to. Boo is just wonderful, both cute and fun. 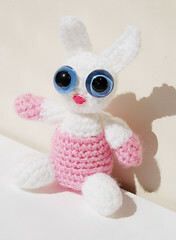 This entry was posted in Crafts and tagged amigurumi, crochet. Bookmark the permalink. Oj, jag kanske smittade dig n?r jag h?lsade p?, fast n?gon feber hade jag inte. Ooooooooo, s? s?t. ?gonen var h?rligt stora. :) Krya p? dig! Oh, that was a wolf. Still, love the big eyes.